Once banks reach a certain size, governments are forced to bail them out when they run in to trouble because of the risks they pose to the wider economy — they are ‘too big to fail’. This creates a perverse incentive for such banks to take more risks than they would otherwise, a key cause of the financial crisis of 2008. 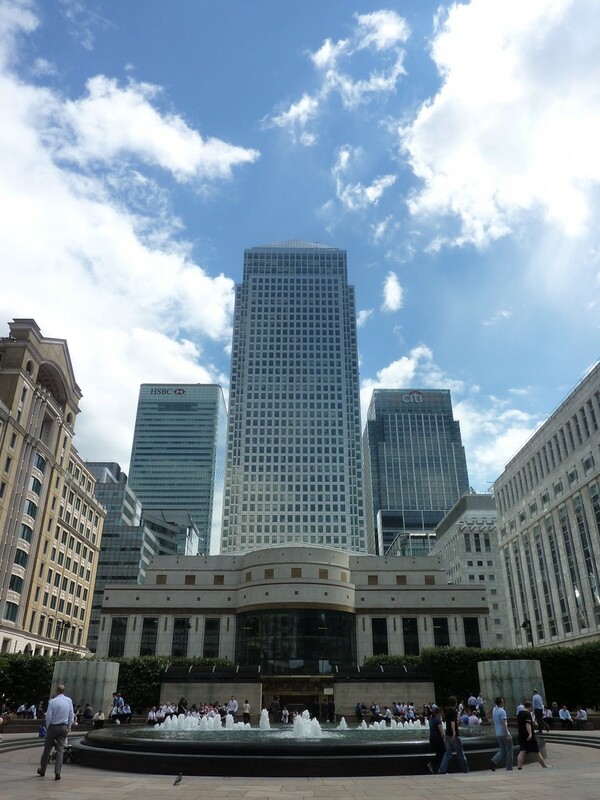 Andy Haldane, the Bank of England’s free-thinking Chief Economist, described this relationship between modern banks and the state as a ‘doom loop’. Haldane pointed to the late nineteenth century creation of limited liability corporate structures as an important driver of banks’ excessive growth. These structures encouraged risk taking by capping the losses facing banks’ shareholders. But banks can also limit their losses by securing their loans against land. This means if the borrower defaults, the bank can repossess their home. This can create a different, but equally dangerous ‘doom loop’. The cycle works as follows: if the growth of mortgage lending outpaces the supply of new homes, this will inevitably cause a rise in house prices. As house prices rise, households are forced to take out larger mortgage loans to get on the housing ladder, boosting banks’ profits and capital. This enables them to issue more loans, which further pushes up prices until such a point that house prices are many times people’s incomes. 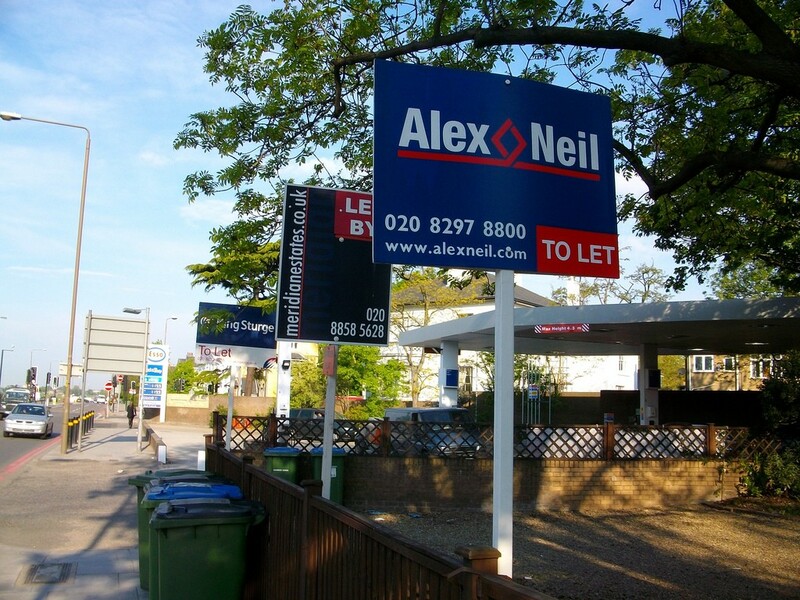 In the UK average house prices are now nine times disposable income, a similar level similar to that which they reached before the financial crisis. The process can continue until there is an economic shock (e.g. a rise in interest rates or fall in salaries) and people’s incomes can no longer keep up with debt repayments. Then the whole process goes in to reverse — there may be mortgage defaults, falls in house prices falls, a contraction of bank lending, recession and, potentially, a financial crisis. There have always been booms and busts involving bank lending. 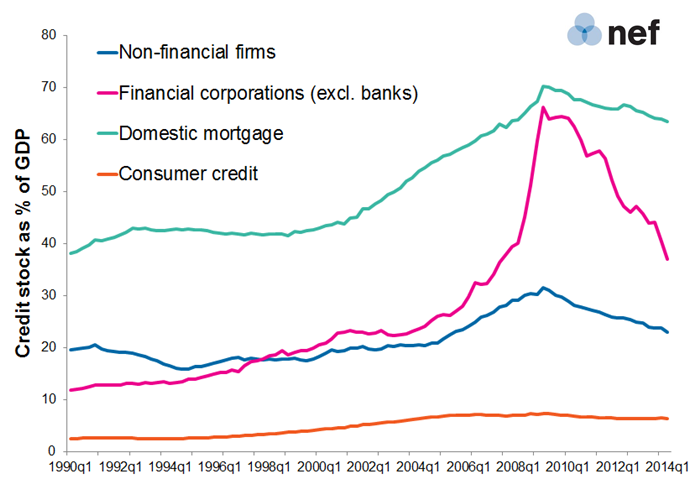 But historically they have involved banks’ lending to businesses, not households — the ‘business cycle’. If you read any economics textbook, it will say a bank’s main role is the ‘intermediation of household savings for business investment’ or something similar. This definition is no longer accurate. The UK is a prime example. Figure 1 shows that domestic mortgage lending (green line) has expanded from 40% of GDP in 1990 to over 60% now, while lending to non-financial firms — i.e. ordinary businesses who wish to expand or need working capital — (blue line) has stayed between 20% and 30% of GDP. 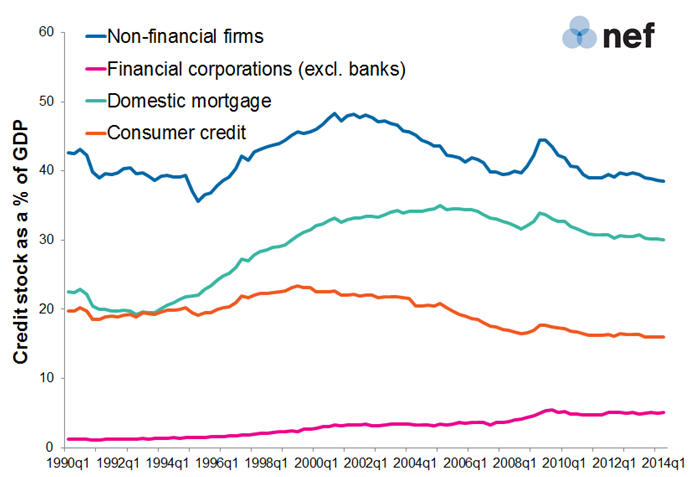 The UK also saw a huge rise in lending to other non-bank financial corporations (e.g. hedge and asset-management funds) (pink line) but this has contracted considerably since the crisis. In contrast mortgage lending has hardly moved since the crash. When banks make loans, they create new money in the form of the deposits that appear in our bank accounts, and increase our purchasing power. Therefore, with the majority of UK loans today funding mortgages, the majority of new money is being pumped in to land and housing. Given the limited supply of new homes and concentration of economically desirable land in south east England, the result is, inevitably, higher house prices. For those lucky enough to own homes, rising prices give the feeling of rising wealth and encourage more spending (the ‘wealth effect’). Homeowners can also boost their spending power by borrowing money against the value of their property with home equity loans (the ‘collateral consumption’ effect). Given that household consumption contributes around two-thirds of GDP growth in the UK, household purchasing power is vitally important for the UK’s wider economic health. It is hardly surprising that the first thing the former coalition government did to try and boost the economy post-crisis was to boost house prices and home ownership by subsidising mortgages via the Help-to-Buy equity loan scheme. But mortgage debt cannot keep on growing forever relative to incomes, even if it is subsidised by governments. At a certain point, people will begin to cut back as more and more of their wage packets are taken up with mortgage repayments. Is a different path possible? Although the general pattern in advanced economies has been a shift towards mortgage lending, there are some interesting exceptions to the rule. The equivalent breakdown of credit stocks for Germany tells a different story. In Germany, bank lending to non-financial businesses is significantly higher than mortgage lending at 40% of GDP, while mortgage lending has only increased to around 30% of GDP. With both Germany and the UK subject to similar interest rates and other external conditions over the last few decades, it’s clear that there are institutional or country specific effects at work. There are two major differences between the countries. 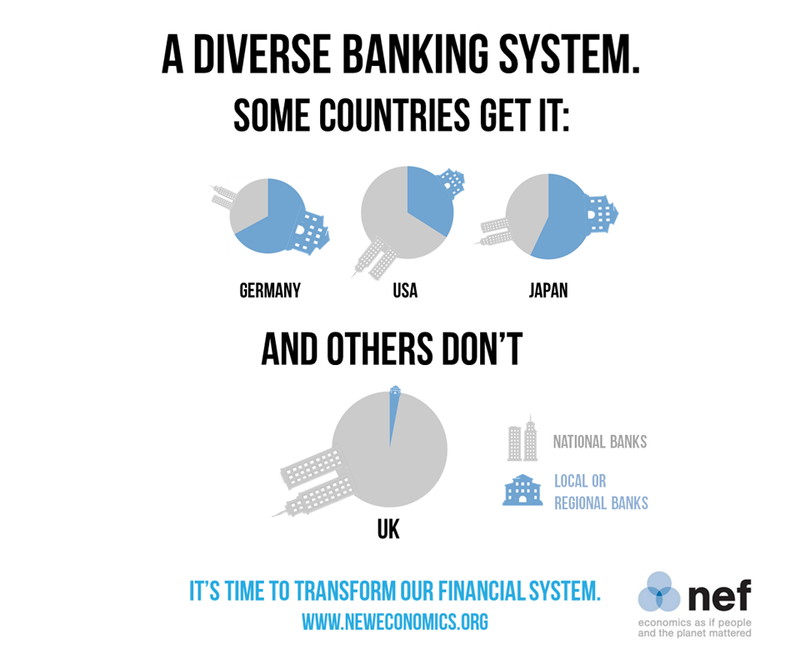 The UK is dominated by four or five very large national or international shareholder owned banks — controlling around 80% of retail deposits. This is the result of successive waves of deregulation, with banks permitted to engage in mortgage lending in the early 1980s (before then only building societies could do so) and a continued relaxation of mortgage lending regulations through the 1990s. This led to the eventual swallowing up of much of the mutual sector via mergers and acquisitions. The UK has a strong ‘transaction’ banking culture. This is characterised by a preference for short-term business loans, centralised and automated credit-scoring techniques to make loan decisions, a need for high quarterly returns on equity and a strong preference for collateral. As UK banks have become larger and increasingly highly leveraged, they have increasingly sought to lend against existing assets — in particular property or land — which they can claim in case of default. Collateralised loans such as mortgage-backed securities are also quite easy for banks to package up and sell on to other financial corporations — a process called ‘securitization’. This has generated an additional form of income for large banks and they engaged in such activity huge scale in the lead up to the financial crisis. By contrast, in Germany there is a much stronger culture of ‘relationship banking’. Two-thirds of bank deposits are controlled by either cooperative or public savings banks, most of which are owned by regional or local people and/or businesses. These ‘stakeholder banks’ are focused on business lending, do not have such stringent collateral requirements and devolve decision making to branches. Rather than always seeking collateral, they de-risk their loans by building up strong and long-lasting relationships and an understanding of the businesses they lend to. 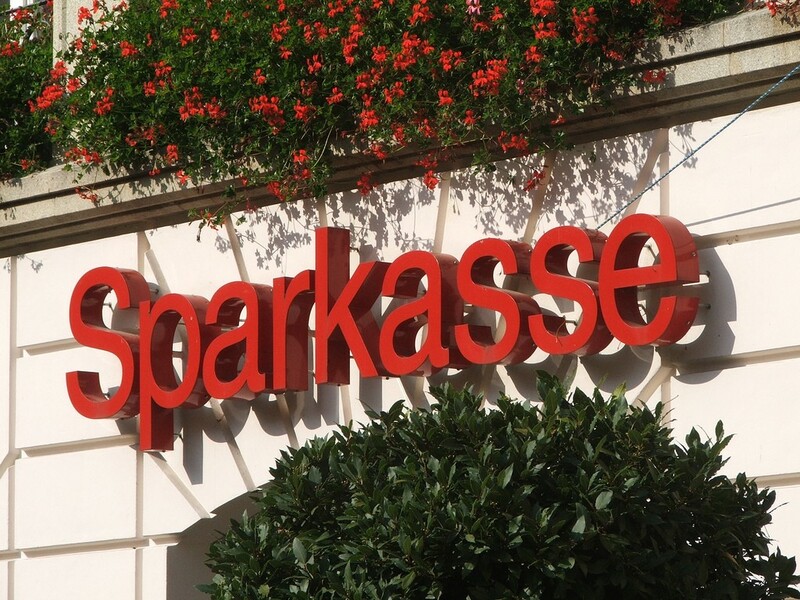 It is these banks that have enabled Germany’s famous regional small and medium enterprise sector (the ‘Mittelstand’) to thrive. Germany has a completely different land economy. 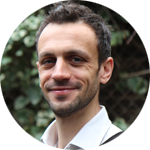 It has more relaxed and decentralised planning laws and a relatively elastic supply of land as a result, as well as a diverse construction industry, including private and cooperative developers and a strong self-build industry. In addition, only half of Germans own their own homes (in the UK it is two-thirds) with the majority enjoying a well-regulated private rental sector offering much better quality and security than the UK. 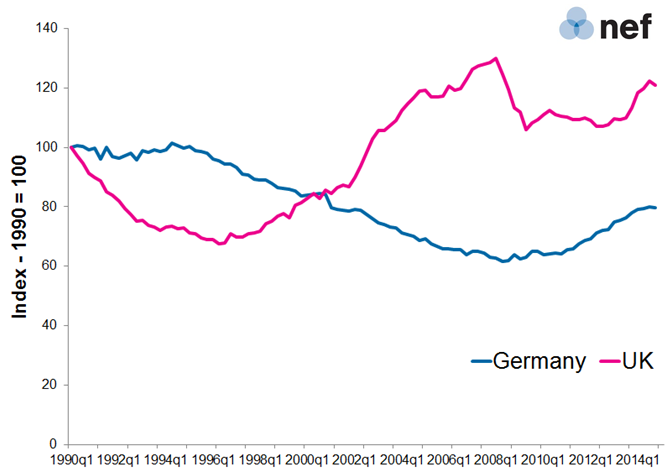 The result is average house prices have changed little in Germany over the last few decades. In fact, the cost of homes in relation to incomes actually dropped in Germany during the 2000s, in contrast to a huge and unsustainable expansion in the UK. In the UK, we have a tightly controlled planning system and a construction industry dominated by large private shareholder firms — not dissimilar to our banking system. Public sector home building collapsed in the mid-1980s. Even when private developers get hold of land, there is no guarantee they will build on it: land value rises so quickly that it may make more sense to simply ‘bank’ it or sell it. The strong culture of home ownership in the UK is also driven by the potential for speculative gain. As pensions and social security have been reduced by successive governments and median wages have stagnated, homes have become a way of investing in our own future economic security. Government policy has encouraged this shift towards ‘asset-based welfare’. 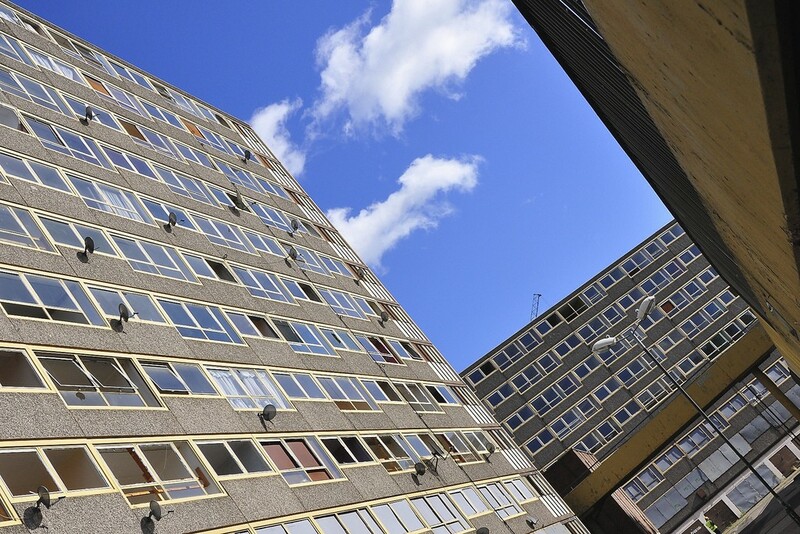 A combination of financial deregulation, ill-thought out planning and housing policy and changes in welfare have resulted in UK land and housing becoming ‘financialised’. 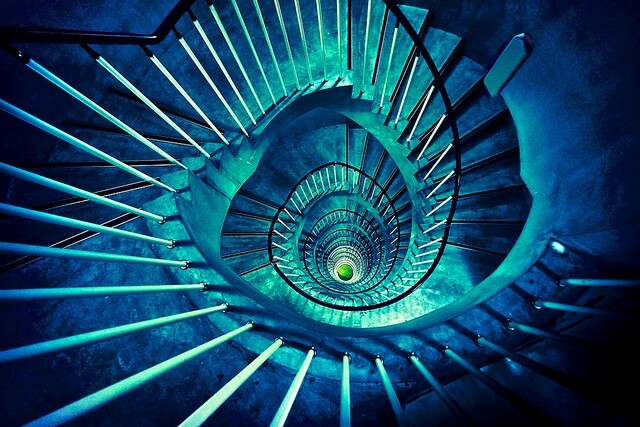 ‘Getting on the housing ladder’ may sound like an innocuous phrase, but what it actually means is accessing the most desirable financial asset, capable of increasing our paper wealth many times more than moving job or investing in the stock market or government bonds. The result is a seemingly never ending housing bubble. UK average house prices are now on average nine times that of incomes across England and Wales, and up to 20 times incomes in more desirable areas such as the South East of England. The current bubble is being maintained, just as the last one that led to the crisis was, by government policy. The latest intervention is a huge expansion of George Osborne’s ‘Help-to-Buy’ scheme. The government is going to offer equity loans to first-time buyers on a massive scale as well as investing in new home building by subsidizing private developers. New build homes are to be welcomed but there is little evidence that private sector home builders are capable of building on the scale required. It also seems likely that guaranteeing mortgages on this scale will worsen our already precarious household debt to income ratio. 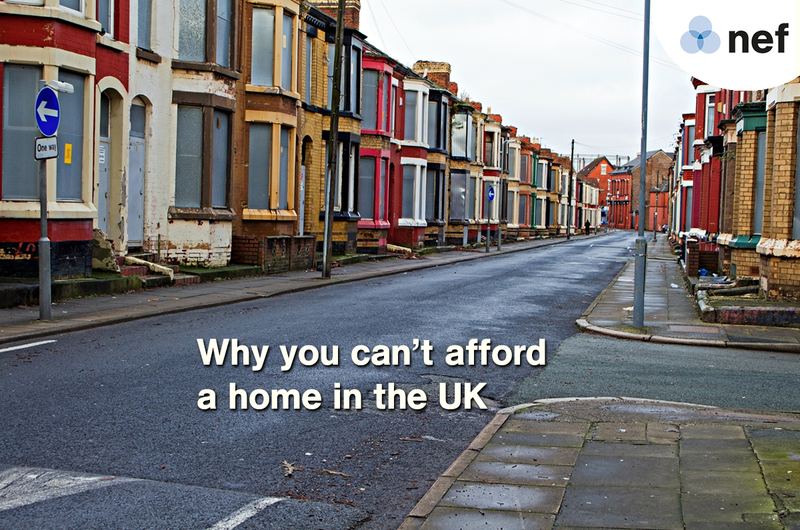 Research by Shelter found the previous Help-to-Buy scheme raised average house prices by over £8,250. One wonders what the Bank of England, which recently sounded the alarm about the Buy-to-Let market overheating, makes of such a scheme. To break the land-economy-finance ‘doom-loop’, multiple interventions are required in both our financial system and our land economy. We need to refocus our banks and the wider economy on productive investment, including the building of homes, and away from lending against existing assets. Breaking up one of our part-nationalised mega-banks in to a network of regional banks, owned by local stakeholders and focused on local business relationship lending seems like an obvious option. We also need our land to be used according to the needs of the whole population, rather than as a form of speculative asset for banks, construction companies or individuals. Unlike other commodities, land is not subject to the standard rules of mainstream economics. It is finite and more of it cannot simply be produced when demand increases. The control over and ownership of land, particularly in economically desirable areas, enables individuals and companies to earn vast profits. There is a strong case for fundamental changes in the way land is taxed, controlled and used. The speculative profits arising from owning desirable land need to be either taxed or captured by local or national governments — or perhaps communities — by owning the land themselves. These may seem like radical structural interventions for the UK. But the alternative is worsening inequality, rising prices and rents and, eventually, economic and financial collapse as the bubble bursts yet again.